The Tempranillo grape is cultivated all around Spain and it's found in more than half the "Denominaciones de Origen" designated wines from that country. 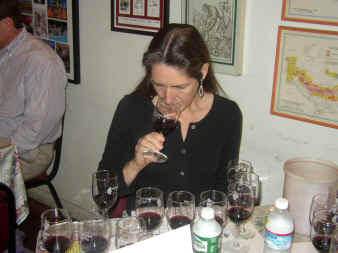 Further, you'll find it in about 27 of the 49 "Vino de la Tierra" appellation bottlings as well. Of course, to confuse consumers, it takes a different name in many regions. You'll find it wearing the name "Cencibel" in Ciudad Real, Cuenca, Guadalajara and Madrid, for example. Some Madrid-area regions call it "Tinto Fino," too, or Tinto de Madrid. In Zamora you'll find it called "Tinta de Toro." In the famous Ribera del Duero it goes by the name Tinto del Pas. In Peneds they call it "Ull de Llebre," while in Burgos it's "Vid de Aranda." 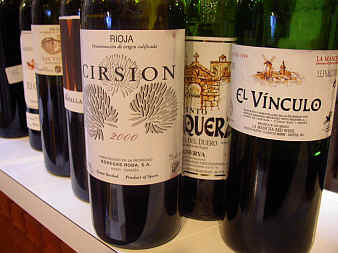 In the Rioja region, the grape provides varying characteristics. In the Rioja Alta area, it is color poor as the area is a bit cooler. In the Rioja Alavesa it can provide more color, but less acidity thanks, I'm told, to higher levels of potassium, generally, in the soils. It is for this reason, supposedly, many producers blend Tempranillo from both areas. In the Ribera del Duero producers contend the grape is perfectly suited. 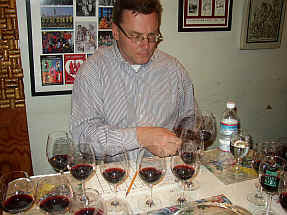 The wines have color and a good balance of acidity. In any case, the grape is said to produce its best wines in places with warm days and cool night-time temperatures. Today the consumer is faced with a huge range of choices. There are delightful wines at the low end of the pricing spectrum, to be sure. We assembled a set of some top-rated Spanish wines based on Tempranillo. One bottle was pretty much disqualified by most tasters, as it has elements suggesting a corked bottle. Two wines were "neck and neck" in the finally tally, though the price differential is substantial! Five of the right wines had a first place vote and five had at least one last place vote! Awaiting the Word From Bob. 8th Place: FINCA ALLENDE 2000 "CALVARIO"
This was a corked bottle, though the wine did have some redeeming qualities. One person even rated it as their top choice, though most tasters felt this was tainted. We shall have to re-taste it to come to a meaningful evaluation. 7th Place: RAMN BILBAO 1999 "MIRTO"
One critic felt this was "mildly hard-edged," finding "unripe black fruit notes, game and a chalky midpalate, with earthy elements." Another person said it was "low in acidity and rather warm." A third taster found some "stony, minerally notes with sharp tannins and salty notes." Another person agreed, detecting a "salty" character here. Gerald found the nose to be rather nice, the wine having some "nice berry elements, with red & black fruit notes and some good oak. The same features come through on the palate, though it's slightly less intense. Good wine. One star on my three star scale, no stars being a standard or average wine." 6th Place: ABADIA RETUERTA 1999 "CUVE EL CAMPANARIO"
"The nose was great," said one panel member, "but the wine is tart and has a concentrated, tart berry character and some grapiness. There's really not a lot of stuffing here." Someone else found "seductive, dark roasted espresso coffee notes, along with some tobacco leaf and spice qualities." A third critic characterized this as "Modern, extracted wine with gritty tannins and, while the wine is dense, it's also very coarse and unbalanced." 5th Place: SEORIO de SAN VICENTE 1999 "San Vicente"
"This has long, rich fruit notes with hints of chocolate, some oak, sweet vanilla and toast, with ripe, firm tannins." 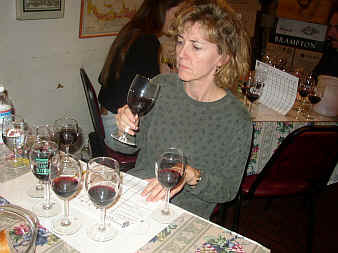 said one tasting participant. Another found a "ripe, rich nose with a hint of olive and a sweet quality, but it let me down on the palate. I also detect a note reminiscent of salami or meat in this wine." A third found "herbal fruit with a touch of oak and a little bit of a leathery, Brettanomyces character on the palate." Gerald said this was a shade or two "lighter in color than most of the wines. It has some woodsy notes and a hint of mint. The wine strikes me as older or more mature than most of these. It's lightly earthy on the palate, with a leathery note. Not my favorite." 4th Place: Compania de Vinos TELMO RODRIGUEZ 1999 "ALTO MATALLANA"
"Lots of smoke to this wine though it's nicely restrained, well-balanced and has hints of rose petals." Negatively, one woman described this as tasting like "licking rusty pipes." 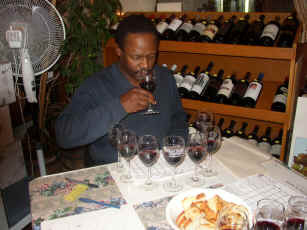 An enthusiastic taster found "Great, ripe fruit on the nose with sweet berry fragrances. It's well-balanced and I was totally seduced by the long finish." Someone else found this to be "terrific! It's got some meaty, salami-like character and is classic Tempranillo." 3rd Place: ALEJANDRO FERNANDEZ 1999 "EL VINCULO RESERVA"
"Here's a lush, rich wine with oak up front, and sporting nice, black cherry fruit. It has velvety tannins and a minerally fruit finish." said one taster. Another criticized this for being "too over-the-top. Too sweet and sugary with odd, stewed tomato notes on the palate." Someone else was smitten by this, saying "It's my number one wine! Very complex!" But another critic felt "The oak is overwhelming and it's sharp on the palate, suggesting there's a note of volatility. The wine has a sour, oaky finish to it." Gerald was a fan of this curious wine. "It has a decidedly chocolate-mint quality. Happily there's a fair bit of berryish fruit, too, but the aromas are quite like peppermint. It's even more expressive on the palate with the chocolate overtones and minty notes. Still, it's a very good wine. Two stars." 2nd Place: ALEJANDRO FERNANDEZ 1999 "TINTO PESQUERA RESERVA"
"There's a bit of a barnyard quality to the nose of this wine, along with nuances of melted brown sugar and green tea." said one critic. Another felt this was "tight on the nose with a touch of a roasted meat fragrance and some wet stone minerality. It's bright and complex with some rich blackberry fruit and smoky oak." A critic who preferred the Telmo Rodriguez wine said "It doesn't have nearly as much substance as the Alta Matallana as this is thin and hollow." Gerald encountered "A berryish fruit fragrance with light oak and a touch of a citrus peel quality. Even a bit floral. Very nice nose. The wine is very well-balanced and polished on the palate, showing the same fruit qualities and nice oak. Good length to the finish, as well. Very fine. One-and-a-half to two stars." 1st Place: BODEGA RODA 2000 "CIRSION"
One taster said this reminded her of "Candy Corn, cardamom and allspice." Someone else found "blackberry, bramble, chocolate, spearmint and fine-grained tannins with soft acidity." Another critic said the wine was "over reliant on the oak." A fourth person found it to be "really rich and concentrated with more on the palate than on the nose." 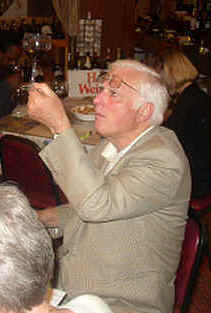 Gerald felt the wine had "good wood, but there's also a slightly 'sharp' element to the oak. It's decidedly 'Spanish' red wine, but, frankly, I can't find $200 worth of quality here. One-and-a-half-stars."